For more information abour our weddings, please go to : www.flowersbyrichardnyc.com. 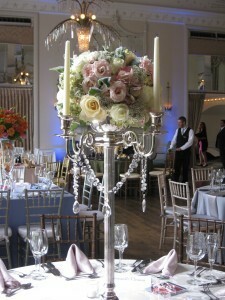 In planning the reception flowers, let your florist know what kind of food will be served and how it will be presented. Will there be a dance floor? Entertainment? Your Reception Flowers Custom-Designed by Flowers By Richard! Fresh flowers can enhance any celebration, from simple single stems to elaborate pedestal ensembles. Choose from Wedding Centerpiece Groupings for the Head Table, Buffet Table, Guest Tables, etc. ~ Flower Arrangements for the Cake Table, Cake Tops, Clusters, Greens and Garlands ~ Archways, Door Wreaths, Pew Markers & Décor, Flowers for the Bride & Groom getaway vehicle and more. Don’t forget to ask us about a free throw-away bouquet! 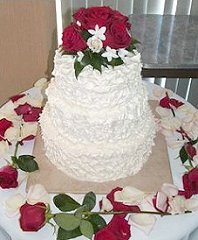 The wedding cake is a primary focal point at every reception, and should be decorated accordingly. Stage the cake in a prominent position in the room, on a special table of its own. When you are deciding on the size, style, and type of your wedding cake, there are many things to consider. Traditionally, wedding cakes have three tiers and are covered with Royal Icing. This doesn't mean that your cake has to be traditional. Colors, chocolate and fresh flowers are gaining much popularity. There's no right or wrong way to decorate a cake, so have fun and explore all your options.